Brick Town Talk: Grand Catastrophe - LEGO Town, Architecture, Building Tips, Inspiration Ideas, and more! Lookout Avenue - (BTT) Moving into a new apartment can be a stressful experience. 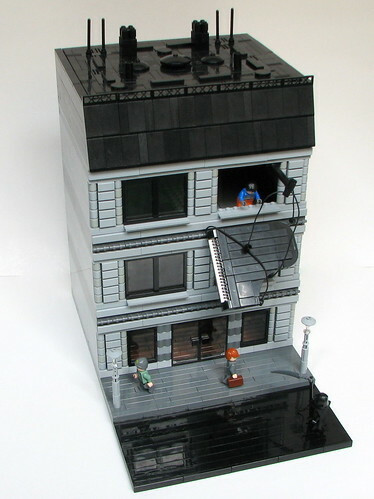 You finally find the perfect place - top floor, spacious, and windows large to fit a grand piano - but you blew your savings on the security deposit and had to settle for a third rate moving company. Although the discount rope certainly isn't helping matters, one can't feel that the mysterious man in the dark cloak eyeing the red-headed businessman has something to do with this unfortunate musical mishap.